Usually, the term "London Broil" refers to a marinated flank or round steak which is broiled or grilled and is then cut against the grain into thin strips. But who says it has to be a cut of beef? Why not do the same thing with a whole boneless turkey breast? Suppose you only have a few mouths to feed for Thanksgiving, and every year the leftover turkey goes to waste because there's just too much! Well, this is the perfect Thanksgiving solution when one doesn't want to cook an entire turkey. Serve it with some stuffing, cranberries, and a vegetable or two, and there's your perfect Thanksgiving turkey dinner! 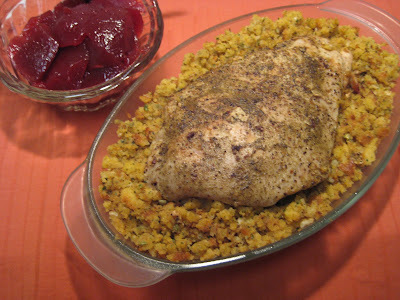 Place turkey breast in a shallow casserole dish or small roasting pan. Drizzle generously with melted butter. Sprinkle with salt, pepper, and poultry seasoning. Place the pan in the oven and roast it for about 20-25 minutes per pound. When it's no longer pink in the center and slightly firm to the touch, remove it from the oven. Let it rest for about 10-15 minutes before slicing. Add any spices you like! For a spicier kick, add a little Cajun seasoning. To keep it moist while it's resting, baste it with some of the melted butter and turkey juices! Your turkey breast can also be grilled or broiled. Just place the meat about 3 inches away from the heat source, and be sure turn it so it doesn't burn.